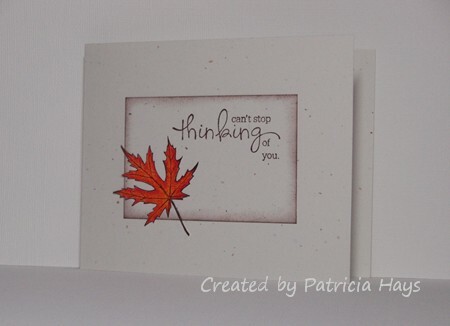 This week’s Clean and Simple Challenge at Splitcoaststampers is all about leaves. Stamped or die-cut, however you want to use them on a CAS card is up to you. I haven’t had much free time for stamping this weekend, so this is what I came up with pretty quickly Sunday evening. Coloring the leaf and cutting it out were the time-consuming parts of this card. But the whole process still took me less than 30 minutes. And now I have another card for the box I’m planning to ship to Operation Write Home in October. Posted by PH in VA at 9:00 am Cards, Lizzie Anne Designs, Operation Write Home, SCS CAS Design Team, Splitcoast challenges, Stampin' Up!